Tahltan Athabascans played a traditional gambling game similar to that of their Tlingit neighbors, involving a trump stick and others shuffled beneath shredded cedar bark. 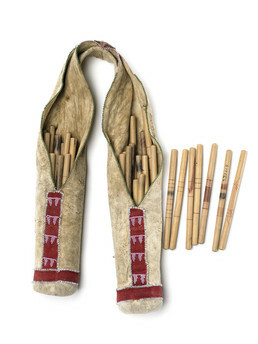 This tanned caribou hide bag has a pocket at each end to hold the smooth wooden playing sticks, which are marked with black and red designs to designate their names and values. The bag is decorated with red flannel and glass beads and was made to hang over the shoulder.